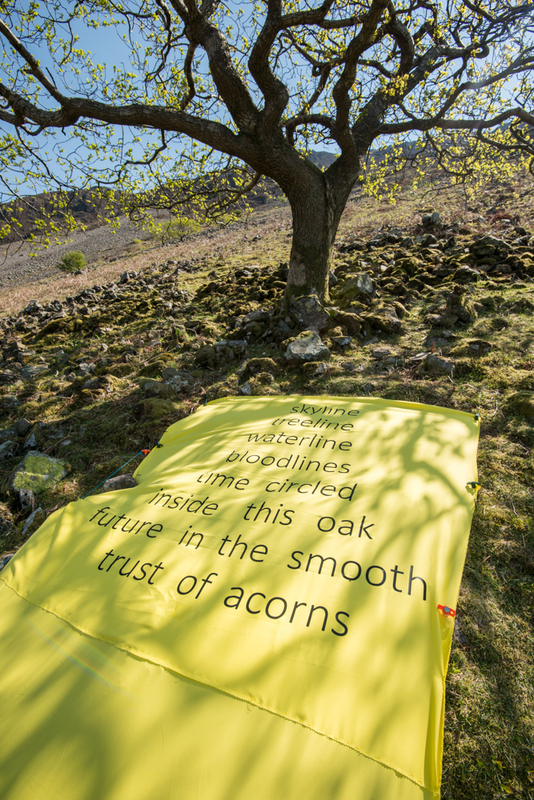 Following the installation of a yellow line connecting the Wasdale Oak to the shores of Wastwater, we’ve had a strong reaction – both positive and negative. One of the important roles of art is to provoke debate and discussion, so this isn’t unexpected, but our intention was never to cause an upset. We thought it would be useful to reiterate the context for this piece. The line will be in place for less than two weeks. It is 1.5 metres wide and just over a hundred metres long. This is tiny in proportion of the landscape, yet it does disrupt the accepted view of Wasdale Screes. It is a trigger for a consideration of the way we view and celebrate our stunning landscapes and how we are inspired by them and care for them. Fittingly enough, these are the main subjects that have arisen in the debate about the line. By highlighting a very small part of the vast, dramatic screes it invites attention to the smaller details – in this case a single tree – in the wide sweeping hills that so many people love passionately. The Lake District has for centuries been the inspiration for artists and writers. Our own response to this part of Wasdale follows our encounters with it over several years, and builds on our wider contemplation of one particular tree, an oak that is thriving in a harsh environment. We have become particularly interested in the way that everything is connected and offer the line as a reflection of nature’s interconnections, with a suggestion (through the break in the line) that it is humans, rather than other aspects of the natural world, that have the ability to disturb these connections. If you take the age of the earth as 24 hours, humans have been on this planet for what amounts to little more than a few minutes, with the enormous evolution of industry and pollution occurring in just a few seconds of that time. The impact that this very slim line has on the much larger backdrop of the screes is illustrative of this global story. In the National Park there is continued effort by organisations, by farmers and by individuals, through passionate personal work and by communal endeavours, to protect this landscape and to accommodate many different demands on it. Our attention to trees through The Long View is one that allows us to examine the small details of how each tree behaves through the seasons, as well as the much larger picture of how trees fit in the landscape, how we enjoy walking through this national park and spending time in its popular areas as well as its hidden corners, and the stories it holds in its rich history of farming, industry, walking, climbing, conservation movements, literature and art. The combined purpose of the line was to draw attention to the details within a wonderful and dramatic landscape, and to invite people to join in a debate about the evolution of the national park in the twenty-first century, including the management of land to accommodate trees, grazing areas for the county’s many hill farmers, and access for walkers and tourists. The line will not last but the debate continues and with a long-term project like this questions and points for discussion emerge as the project evolves. If you would like to get involved please let us know what it is that you value. One way of doing this is to fill in the survey about the way you like landscapes to appear here in the National Park. Another is to share your stories with us, about trees or woods that have inspired you. Thank you. Please note: if you choose to go and see the installation please view it from the roadside. The paths on the scree side of the lake cross steep and unstable slopes and in parts are extremely challenging. Although there is a public right of way access is very difficult. Thanks David. It certainly is a raw and powerful landscape and thanks for celebrating with us. I shall view it from solid ground! It’s certainly best, and safest viewed from the road side of the the lake Jackie. Go see and let us know what you think. Went to have a look yesterday. Travelled from Wasdale head to Wasdale and missed it! Hi Jackie – sorry that you missed it. We took the piece down on Saturday evening, quietly, without fuss. There were seven of us including three people we didn’t know who loved what we had done and wanted to help out. It was there for just a week, but its mark will be felt a little longer. Hope you still had a nice time in Wasdale anyway, it is a remarkably beautiful part of the world. Who funded this art and how much was paid please? The Long View is running over a long period and involves 18 months of our own ‘field work’ and art development, the involvement of seven primary schools, seven public walks, engagement with sixth form students and university students and lecturers from cities outside Cumbria, and an exhibition that will be on show in numerous venues over a period of more than a year, as well as a few other strands. We have raised most of the money we need but are still short of funds and although we’re still fundraising we have dug into our own pockets for certain elements of the project. The money for this particular installation has come from us. The cost for the material and pegs is approximately £800 and we bought beer and crisps for the people who very kindly helped us put it in place, and gave them some petrol money. The power of a line – what is its point? As the breeze blows across Wastwater the flutter of fabric gently blurs the image and I wonder if the fury at this sensitive installation is anchored in a belief that the landscape should be preserved in a set time, yet that time is always in flux as nature works her magic. Let the artists work their magic – their tread is soft, heartfelt and gentle on the land…and temporary. How we view and use and relate to our land is an immediate imperative for us to consider. If I were Capt Kirk arriving on this earth like planet I think I would be struck by the incredible and destructive divisions in belief systems among its inhabitants, by the wanton self-destruction, by the imperative to dominate and find technical solutions to the implicit wars between cultures, by the petty nature of personal opinion and economic warfare, while at the same time thinking that this planet looks like an incredible oasis in the universe. The inhabitants seem to not see what they live on and share and how valuable that planet is – even to the inhabitants and their own futures. In a small place I might find something that shows that there is consideration of this, a small temporary mark in a landscape, something that some inhabitants have made to draw attention to the land, to say stop and think, stop travelling through it and admiring it through car windows, to stop just viewing it as a tourism asset or as something to be just preserved in aspic. I would see this temporary mark as significant evidence that some inhabitants have intelligence and love for their planet, and I would seek out those who made it as people to talk to. Great effort and glad you are getting attention. It amazes me that people are criticizing this as vandalism or for being ugly. The installation is temporary and, to me, the yellow line is reminiscent of highways / construcution and other permanent eye sores. Temporarily disrupting the beauty of this area is a nice way of giving people an advance warning / reminder of how awful permanent disruptions would be so that they can pause to think / act before it is too late. Bravo and good luck. The photographs we see of the wanton destruction of our planet, in comparison to this little piece of yellow highlighter made physical, shows how easy it is to destroy, yet how easy it is to celebrate. This installation to me, draws attention to the tree and to its fragility, yet strength. An oak! On a scree! We are in this together, it’s everyone’s world, everyone’s planet – but we needn’t ruin, we can marvel instead.